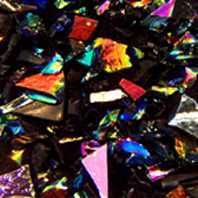 All of our Dichroic products are made by Coatings by Sandberg (CBS) and are the finest quality on the market today. Each tube of Stringers has 10 assorted pieces. All Dichroic Noodle and Stringer pieces are approximately 17 inches long.